For a long distance, we drove on a secluded road, driving across what seemed like a hill, until we entered yet another village. There were too many bifurcations here and had to stop to ask the locals. After some more distance, we started spotting the river running parallel to the road and we were instantly excited. We noticed a lot of people camping/picnicking at several spots along the river bank. They must have come down for a leisure day trip by the river and the hills. We were stopped by two men collecting entrance fee to the fishing camp (Rs 50.) . We found that quite strange as the JLR folks had not informed us about it, none of the blogs we’d read had mentioned it, and there was no official board indicating it was some kind of toll/fee. We paid up and drove off. Just a few meters ahead, we arrived at the destination on the left, at around 12.30 pm. As we had handbags to carry and apparently the log hut assigned to us was at some distance, a jeep ride was arranged to deliver us. It was a short, bumpy ride through the jungle. We suddenly felt like having been transported to a place in the middle of a jungle, amidst nature, hills, and rivers. Our log hut was right next to the main dining area, a stilted enclosure with thatched rooftop. As we quickly scanned the surroundings, to one side of our log hut was a hammock under the shade of a tree and right in front of the log hut was the river at a hop-skip-jump distance. 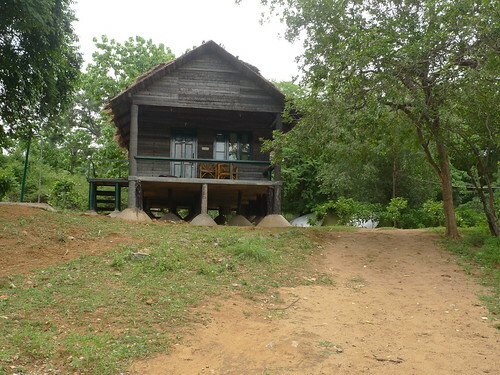 The stilted log hut looked quite comfortable – bed, bath, and AC. No television, no room service. Two chairs and a table in the log hut balcony. We felt content with the whole set up; could not have asked for more! We were already dreading the ride back the next day. We quickly freshened up and headed towards the river. The mud sloped down from the log hut to the river. 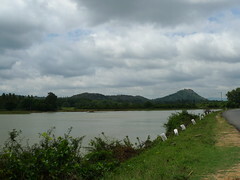 In the rainy season, the river reportedly swells up and the water level rises up the slope. Guess, thats why the log huts were stilted. The other bank of the river was lined with trees and hills in the background. The calm and serene water instantly compelled us to relax and just be. The river was dotted with numerous small and big rocks. We could hear the river gurgling at the far end. The clean and pleasant air embraced us with open arms. I literally locked all the thinking, planning, worrying of the real world in the last room in some remote corner of my mind. This was the moment I had yearned for so long. As we took a stroll after lunch, we noticed the other log huts, around eight of them; each was provisioned with a hammock and overlooked the river. There were also some swings made of wooden planks and tied to tall trees using thick, long ropes. They were fun. Further away from the river were tented cottages. Though the roof and front portion was tented, the rear was made of brick and cement. Might try the tents the next time we come here. We rested and napped before it was time for evening tea and snacks. This was to be followed by coracle ride and kayaking. The kayaking was unguided and came at an extra cost. Since neither of us knows how to swim, we chose the coracle option. The guy who gave us the ride filled us in quite a bit about the tourist season and the history and geography of the place. We had heard a lot about crocs in this side of the river and were a little on our edges, until this guy actually spotted one that was camouflaging on the rocks in the middle of the river. As we got closer, thankfully, the croc went back to the water and we moved away and completed our round of the river. So much for adventure! Later in the evening, the resort folks had arranged for seating and barbecue by the river. But the arrangements were spoiled by the rains and they had to move everything inside the dining hall. The rain compelled us to stay indoors after the snacks. Not sure if it was the awesome weather or the lack of worries, but we were hungry soon after, as it continued to pour heavily outside. Luckily, it wasnt long before someone came to inform us that dinner was ready. We gorged on the warm rotis, rice, curries. Both the meals had been okay so far, not outstanding but not too bad either. There was a lot of variety for vegetarians and one or two options for the non-vegetarians. A guided trekking trip in the morning was part of the package. We got a personalized wake-up call on the door at 6:30 am. The guy also served us morning tea. The night had been peaceful and we had slept like babies. As we barely managed to open our eyes, we decided to drop the trekking. We had come here to relax! So we savored the tea in the balcony and took on the morning freshness and felt saintly, letting the hours pass by unknowingly. The peace was disrupted, yet again by the gurgles from within. So we dressed and headed for breakfast. This meal was sumptuous – hot, off-the-tava dosas, paranthas, omelettes! Just couldnt decide when to stop eating. We took a final walk along the river and this time headed a wee bit far, on our own exploration of the area. Spent some time at a great spot we found and then wandered around a bit, mindlessly. It was hard to let go but our watches constantly reminded us that we had to check out of our log hut soon. We headed back but promised to come back some time again. Snacks (chips, biscuits, and the likes), in case you feel like munching on something between the meals. Retain the Rs. 50 entrance fee receipt; there will be a group of people to verify it on your way out. ‘Outback Adventures‘ at Bheemeshwari organizes several water activities like Burma Loops, Parallel Walking, and Zip Line. The JLR also offer spa and massage services.